Butternut squash is a great source of nutrients. This recipe is a smart choice for those who are looking for a healthy and comforting appetizer or lunch. However, I cannot resist serving this dish with a piece of garlic bread for dipping! In a large pot over medium heat, melt the butter and add the onion, and saute until translucent, 5-7 minutes. Add the garlic and saute until fragrant, 30 seconds. Add the apple, carrot, and butternut squash and coat with the butter. Season with 1 teaspoon salt and 1/2 teaspoon pepper. Add the heated broth to the squash mixture. Add the bay leaf and thyme. Bring to a gentle simmer, and cook until all the vegetables are tender, 20-25 minutes. Remove pot from heat and set aside to cool slightly. Remove bay leaf and any herb stems that remain. 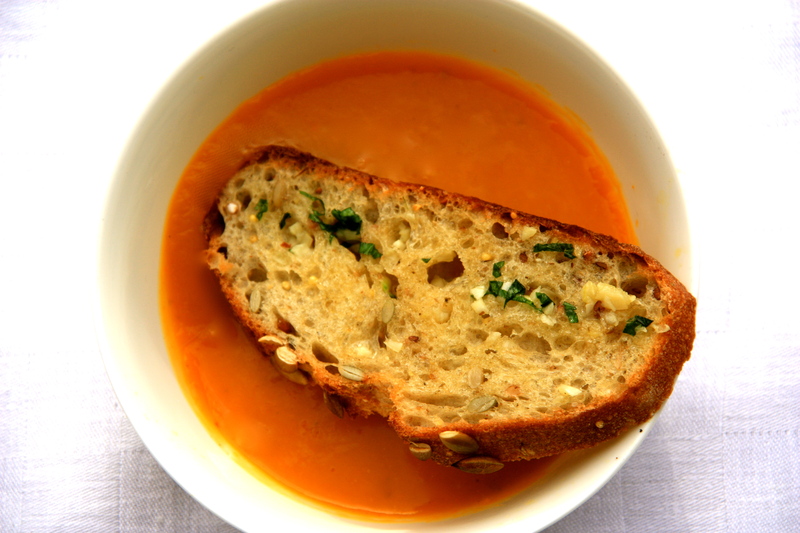 Working in batches, puree the soup in a blender or use an immersion blender directly in the pot. Reheat, season with nutmeg and additional salt and pepper if necessary. Serve hot and enjoy! If you want a richer soup feel free to add 1/2 cup cream when reheating the soup.